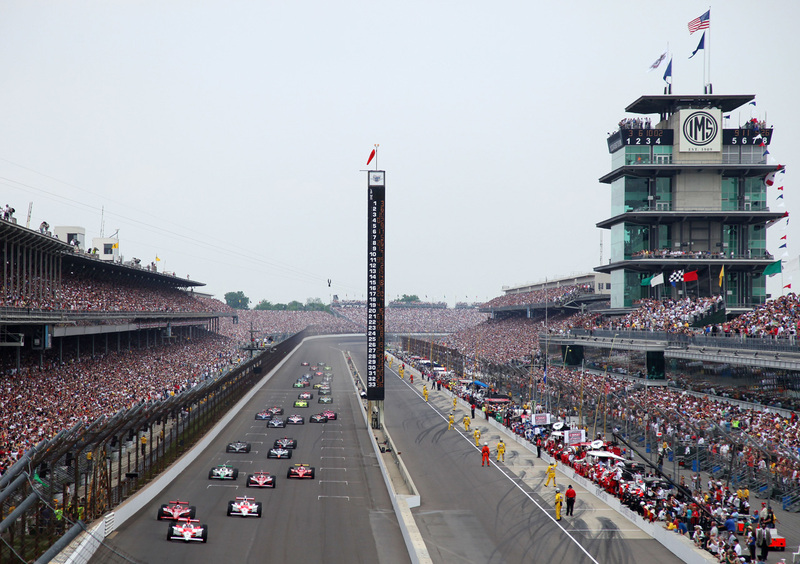 In Terre Haute, and arguably all of Indiana, the phrase (really a term) “The Month of May” is synonymous with the Indianapolis 500. Years ago (this is an example of the problem with not living there) television station WTHI had a segment during their Wednesday newscast called “Racing Wednesday”, during which all the events for the past week from the Indianapolis Motor Speedway were reviewed. Practice, of course, was the big item. Then Time Trials, and other more peripheral activities at the track. But also other racing news from around Terre Haute and the Two-State Area”, which was almost exclusively dirt-track news. My need for speed news was fully satisfied in that time and place. Somebody tell me – Is this still happening? It’s one of those things I miss about my home state. When in Terre Haute, all I had to do was look at the beginning of the sports section of the newspaper or catch the sports segment of the evening news. Everything Indy 500 was right there, first thing – as it should be. Of course. Who doesn’t know that, right? Colorado has its modest share of open wheel racing aficionados, and a fairly rich open wheel history; even drivers – notably Buddy, Jacques, and Bob Lazier, Buzz Calkins, Eddie Cheever (he qualifies because he once lived in Aspen), and AJ Allmendinger (formerly of Champ car, he jumped to NASCAR a couple of years ago). There were even a couple of Champ car teams at one time based here, and no doubt some pockets of fan groups scattered about. But to find any semblance of a priority about it in the local news media, forget it. It is as I say affectionately, “It’s like speaking French to a Hoosier.” They just don’t get it. Although, I am pretty sure there are more people from Indiana speaking French than there are Coloradans watching open wheel racing. Thank you, Speed Channel and Versus, for picking up the ball. Now maybe I won’t starve. So as I ache for those former days of “Racing Wednesday”, at least the Internet and the enhanced cable TV package I pay for provides me a little relief. People like to hear themselves talk. Radio talkshow personalities confirm this for us every day. And it can get pretty miserable after a while. Having said that, I also think people like to read their own writing. I do. And they like to believe somebody else does too. In a much more substantial way, in a much more telling way, and a much riskier way, we like to think we’re RIGHT. That’s why I am stepping out on a limb to provide answers, opinions, and thoughts to consider here. Because I think I’m right. Sort of. We’ve all heard someone say so-and-so is “so opinionated”. The truth is we’re all very opinionated. Why not? We’re built that way. It’s our nature. So rightly, we ought to find some basic level of confidence to not only say what we think but also to defend what we believe. Those are the guidelines I hope to display in this blog. Occasionally I’ll probably flavor my Posts with a bit of humor (debatable, I understand) and possibly with something that could offend someone. It is never my intention, so let me apologize now. It’s only my opinion. I am a very happy but homesick transplant. I am a dedicated Hoosier through and through. I live in Colorado. It’s beautiful, and I – we – have no intention of leaving. But it’s not Indiana. It’s hard to quantify it, but Indiana is – and her people are – something special. Different than anywhere else. But then, all states, all hometowns, and all neighborhoods are. All people are. They are wonderful, full of life and memories, potential and tragedy, love and pain, hope and discouragement – but mostly the good things – wherever they are. They are special to us individually. And they should be. Our places are worth that. For Indiana, and those from Indiana, we’re “in the middle” – in every way you can define it. Not only geographically (actually, we’re off to the side just a little), but culturally-socially, economically, technologically, religiously, politically, and in every other way. And yea, maybe we are actually off to the side just a little. But that’s just the point. Everyone is both. So let’s get together and talk about it. So go ahead, ask me a question, I’ll give you an answer. And I know, I’ll probably get one back again.